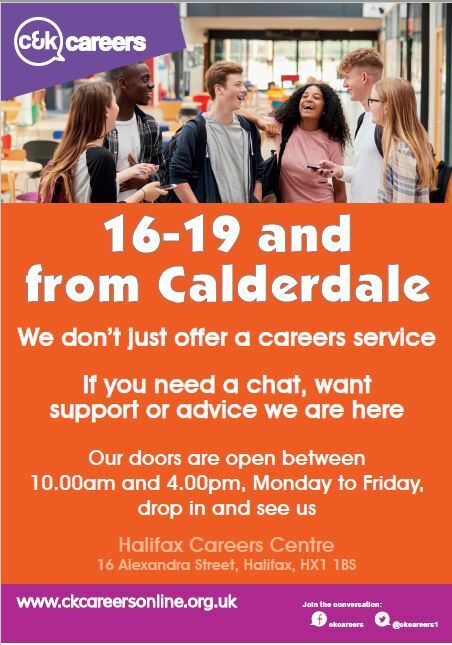 C&K Careers based at their public centre on Alexandra Street in Halifax don’t just offer help with your work and learning options, their door is open if you need support or advice too. Young people can drop in any time for a chat Monday – Friday 10:00am-4:00pm. As a not-for-profit social enterprise, C&K Careers is driven by providing the best possible service to partners and their clients, rather than by making the most money. Any surpluses generated are used to further develop the services. On behalf of schools, colleges, local authorities, prime and area-based contractors and employers, C&K offer high quality, impartial information, advice and guidance (IAG) services to young people and adults, together with related learning and employment support, and training services, which are outlined in the corporate brochure (1.25MB PDF). This entry was posted in Young People and tagged C&K Careers. Lower Valley Friday Flyer 23 November – OUT NOW! !